NEW YORK, AUGUST 28, 2018—Half Mast, a new work by Derek Fordjour, will be the eighth work in the ongoing series of public art installations on the façade of 95 Horatio Street, located directly across from the Whitney Museum of American Art and the High Line. The installation marks the artist’s first museum solo exhibition. Fordjour works primarily in the realm of portrait painting to create vibrant scenes that subtly address subjects of systemic inequality, race, and aspiration, particularly in the context of American identity. Half Mast, a 2018 painting reproduced as a 17 x 29 foot vinyl print, will be unveiled this fall on the southwest corner of Gansevoort and Washington Streets. Half Mast considers the recent national conversation around gun violence, speaking in particular to the surge of school shootings and to the everyday atrocities impacting Black and Brown communities in the United States. 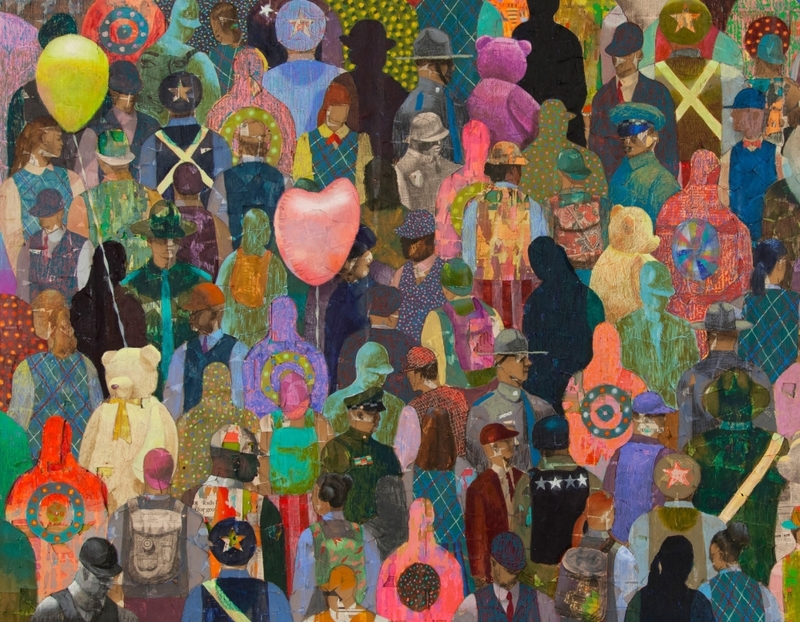 The piece offers a portrait of this complex moment in U.S. history by presenting many figures that are part of this conversation in one compressed, shared space. Seen in the crowd are law enforcement officials and civilians, including students, as well as absent figures, bodies marked with targets, and teddy bears and balloons reminiscent of street side memorials. Printed brightly in Fordjour’s signature graphic style, Half Mast retains a disquietingly buoyant quality while reflecting on loss and the abuse of power. In Half Mast and other work, the artist draws on the language of games, sports, and the carnivalesque, layering the canvas with humble materials—such as newspaper, oil pastels, and charcoal. His palette and use of pattern alludes to Americana and Pop Art as well as the visual culture of his Ghanaian heritage. “The work speaks to the sense of unease and gross neglect that colors much of contemporary life in the United States and serves as a public acknowledgment of loss. Yet the meaning of Derek’s image can also flip. Half Mast alludes to possibilities of a civic movement or celebration and is a reminder of the power of individuals to resist and shape their everyday conditions,” says Allie Tepper, the curatorial project assistant organizing the installation. Fordjour’s practice frequently engages with the use of public space, and Half Mast is one of two current commissions of major public work. The artist is also the recipient of a 2018 MTA Commission for a permanent installation at the 145th Street subway station in Harlem. Half Mast is the eighth work to be featured in this series of public art installations, organized by the Whitney in partnership with TF Cornerstone and High Line Art. The series has featured works by Alex Katz (2014), Michele Abeles (2015), Njideka Akunyili Crosby (2015–2016), Torbjørn Rødland (2016-2017), Puppies Puppies (2017), Do Ho Suh (2017-18), and Christine Sun Kim (2018). Derek Fordjour (b. 1974, Memphis, TN) has exhibited in numerous venues including the Brooklyn Academy of Music, the Sugarhill Children’s Museum, and the Taubman Museum. He is a graduate of Morehouse College, and earned a Master’s Degree in Art Education from Harvard University, and an MFA in Painting at Hunter College. He currently serves as a Core Critic at the Yale University School of Art. Fordjour is the recipient of a 2018 MTA Commission for the entire 145th Street subway station in Harlem. He was awarded a 2018 Deutsche Bank NYFA Fellowship, and was a 2017-18 artist-in-residence at the Sharpe-Walentas Studio Program in New York. He will present a solo exhibition at Night Gallery in Los Angeles in winter 2019.